While the Android fans are still soaking in the goodness of Galaxy Note 7, Samsung and supported carriers aren’t resting. Within less than a week since the launch of its latest phablet, Samsung is rolling out the very first Galaxy Note 7 update. Users who are still waiting for their Note 7 to arrive, you will be getting the latest update right away. Moreover, the Note 7 update is expected to bring the latest August security patches released by Google. If you are worried about the QuadRooter vulnerability affecting a billion devices, rest assured that you getting the latest patches. The update is currently rolling out worldwide in phases, and reports suggest a file size of 96MB. Users are also reporting several performance improvements and essential bug fixes alongside the security update. Traditionally, it takes about a week for carriers to roll out updates once it comes out for unlocked devices. However, Verizon Wireless is ahead of the curve this time by rolling out the latest Note 7 update already. 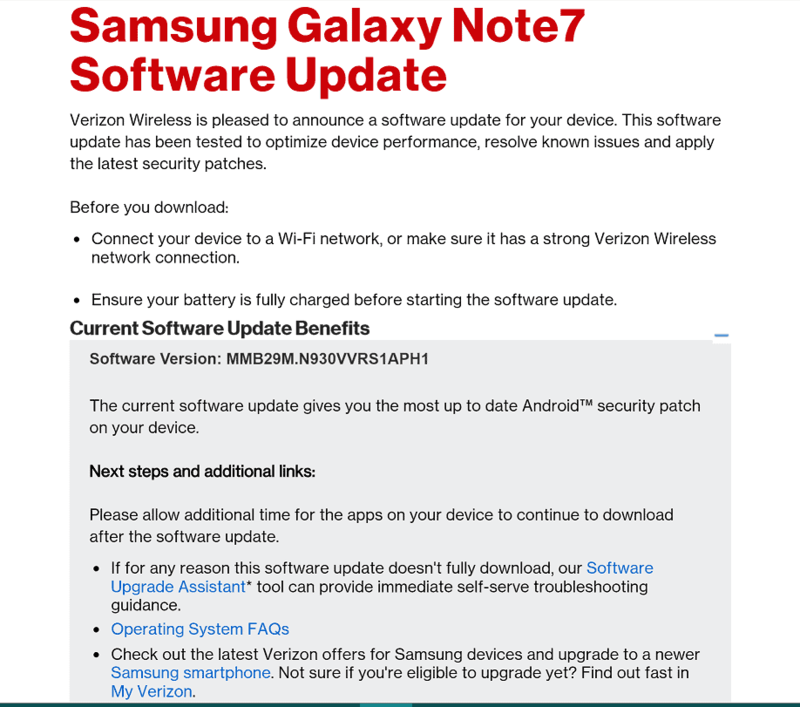 The latest firmware update for Note 7 is rolling out by Verizon under the firmware version MMB29M.N930VVRS1APH1. Regardless of whether your Galaxy is unlocked or on contract, you can check for the latest update manually. Simply head over to Settings->About phone->Software update->Check for updates. Do you want to stay ahead of the line when it comes to receiving the first Galaxy Note 7 update? Make sure you follow the Updato Samsung firmware platform for all the latest software and firmware updates.